Home Care Sheets & Guides Do Goldfish Need Light? And Darkness? How Much Of Each? YES! Goldfish aquariums do need light. But just as importantly, they also need dark. Goldfish, like all living things, live according to daily cycles. In the wild, they eat at certain times during the day and sleep when it’s dark. In an artificial environment, your fish will still benefit from these cycles. An aquarium light will help your aquarium mimic your fish’s natural environment. You see, goldfish have no eyelids. They’re at the mercy of their lighted environment to know when to sleep. A regular cycle of light and dark will benefit your fish and keep your aquarium healthy. Let’s look at some of the factors to consider when setting up your aquarium’s lighting system. How Much Light Do Goldfish Need? How Many Hours Of Light and Dark Do Goldfish Need? Use an Inexpensive Mains Timer – It’s Foolproof! How Do I Know if My Tank gets Too Much Light? What if I’m not Using Enough Light? Conclusion: So, Do Goldfish Need Light? As we mentioned earlier, light is an important part of a fish’s natural cycle. A lighting system that mimics the rhythms of a natural environment will keep your goldfish healthy and happy. Not only will their sleep schedule improve, but they will also develop a routine for eating during “daylight” hours instead of all the time. Lights also help to bring out your fish’s beautiful natural coloring. There’s evidence that without light, goldfish can begin to lose their color and begin to appear pale and drab. A light cycle will also keep algae from growing out of control in your tank, and will help your live plants (if you have them) grow strong and healthy. If there’s no light, live plants cannot photosynthesize and will not grow, 24 hour light and algae blooms can occur, taking over your tank. So you need to strike a good balance between light and dark. The amount of light you should use in your tank depends on a number of factors. If you have a small, freshwater tank with artificial plants, you will only need enough to differentiate between night and day. 1 to 2 watts per gallon of water should be sufficient. However, LIVE Aquarium plants need a lot more light than to use for photosynthesis. Planted aquariums need between 2 and 5 watts of full-spectrum light per gallon of water. Full spectrum light is the important thing to note here. It contains both blue and red wavelengths, essential for photosynthesis, but also contains the colors in between that we humans use for most of our sight. Necessary because, well, I’m sure you want to see your fish and plants, right? You should also consider the height of your tank. A very tall tank will not allow light to make it all the way to the bottom. This could be detrimental to some live plants and you will need far stronger, more penetrative lighting to reach them. Having too much light can confuse your goldfish into thinking that it’s always day, and their bodies will not function in the way they should, the same that would happen to you and I if we were in constant light. An excess of light will disrupt your fish’s natural sleeping and eating behaviors, which can result in ill health. You should try to mimic a natural day / night cycle, not have the lights too bright, and make sure your aquarium is out of direct sunlight. To mimic nature and to help your fish to thrive by matching what would be their normal daily cycles, your goldfish should receive between 8 and 12 hours of darkness each night. This means making sure their tank is in complete darkness for 8 to 12 hours per night and that you certainly do not leave the aquarium lights on 24 hours a day! We highly recommend you use a mains timer for your aquarium lighting. It takes all the work out of making sure your fish have the correct light cycle and experience night and day. Mains timers are a simple and very inexpensive device that sit between your aquarium lighting and the mains supply. You leave your lights permanently on and set the mains timer to turn off for 8 to 12 hours per night. 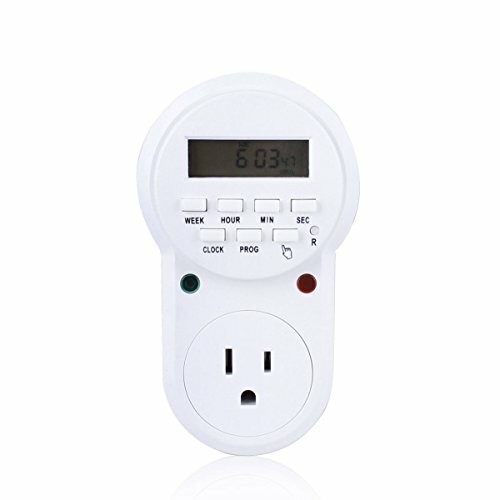 The timer then cuts the power to the light from the mains during the time you specify. Your aquariums light cycle is then taken care of, like clockwork, every day the same, completely hands off for you. And the cycle is even taken care of during any days you spend away from home. We cannot recommend these enough for their simplicity and convenience, and for removing any chance of human error. Extremely high levels of light can send your aquarium into a tailspin, causing algae and parasites to grow out of control. Algae and aquarium plants are photosynthetic, so the more light you offer them, the quicker they will grow. Then parasites that feed on the algae can wreak havoc on your tank’s delicate ecosystem. If you’ve got an algae problem in your tank, usually manifesting itself as very cloudy looking tank water, chances are your lights are too intense or you are leaving them on for too many hours per day. It may also mean the nitrate levels have gotten too high and you should do more frequent water changes as algae feed on the nitrates in the water. The solution is to either downgrade your lighting system, or add more live plants to the tank which will compete with the algae for nutrients and provide shade for your fish. Also test your waters nitrate levels and change out some water if necessary. For more on using too much light in your fish tank, check out this post at the Aquarium Plant Blog. Can goldfish have too little light? Yes of course! If your goldfish aquarium is kept too much in the dark, as we’ve touched on before the most obvious sign will be your fish starting to turn white, sometimes even to an otherworldly looking pale, translucent like white. But more importantly, a lack of light – like having too little – will result in a disruption of your fish’s natural daily cycles and throw off their sleep and eating patterns, and all their natural behavior. Obviously this can effect their health and quality of life. Even a small light will be enough for a fish tank with artificial plants. You only need to provide enough light to see your fish and keep them on schedule. If you have a planted aquarium, you will have to make sure the light reaches the bottom of the aquarium, and provides enough intensity for the plants to photosynthesize. The biggest cause of plant death in your tank is insufficient lighting, both intensity and the type of lighting. Remember it should be full-spectrum and reach down to the plants foliage with enough intensity to photosynthesize. The deeper your tank, the stronger the lights must be. Once upon a time, these were the mainstay for small aquariums. They are the same type of bulb you will have used around your home before the ‘energy saving’ light bulb era. Today they are rarely used. Incandescent lights use a lot of electricity, give off a lot of heat so tend to heat the water in a goldfish aquarium too high, are extremely inefficient and do not produce the right spectrum of light for planted tanks. So all in all, they’re not great. Generally speaking, avoid this type of lighting, especially because your goldfish will not appreciate the heat that they generate. These bulbs are the most commonly used in aquariums today. They ‘re reasonably cheap to buy and quite efficient, therefore relatively economical to run and use. Fluorescent tubes are available in all sorts of lengths, strengths (power output) and color ranges so you can pick from reds, to blues, to full spectrum and are suitable for almost any set-up. 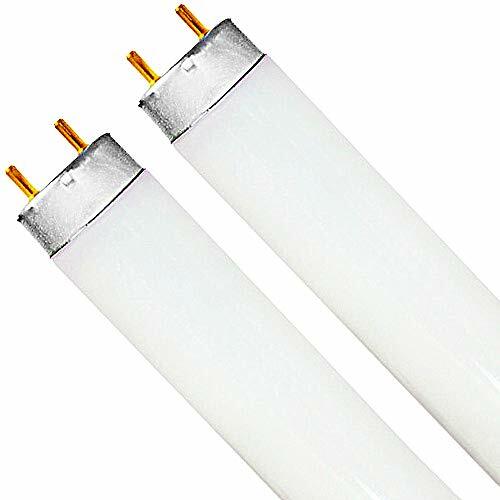 Compact fluorescents, common fluorescents, T5HO and VHO are common examples of fluorescent bulbs you may come across. LED lights are becoming popular in the aquarium industry because they are highly energy efficient, give off very little heat and are very cheap to run, using little electricity and lasting many years. They produce a pleasant shimmering effect that is easy on the eyes, and they make great lunar lighting for nocturnal fish. They do have a slightly higher up-front cost than many other lighting types, but due to lower running costs and little need to – if ever – change the bulbs, they soon make up for this fact and become a cheaper option long term than most other types of lighting. Actinic lights emit the wavelengths of light required for photosynthesis of marine plants and are good for penetrating deep-water aquariums. The light comes from the blue end of the spectrum and for this reason does give a tank a cold looking bluish hue, so it’s recommended to have additional lighting more toward the warmer red end of light to balance things out. These lights are often used in saltwater tanks with plants and live coral. 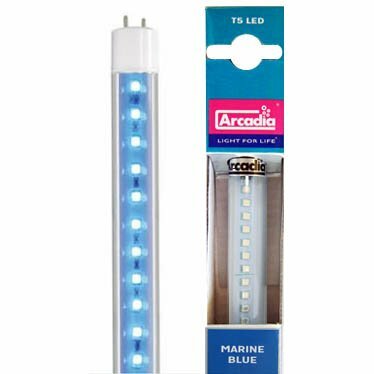 For freshwater aquariums and goldfish tanks, these lights are unnecessarily expensive and ‘full-spectrum’ bulbs are more highly recommended, at least for the beginner aquarist. Full spectrum bulbs do the best job of mimicking natural daylight and so are the best for freshwater planted tanks. Not only are they best for plants, I think they’re best for a natural looking tank. They cover the whole spectrum of light, including blue, green, yellow and red, so give a perfectly natural looking, beautiful light to an aquarium where the true color of fish, plants and decorations can be seen. No blue tint as from standard fluorescents, or red tint as seen from incandescent. These high-intensity bulbs produce more lumens per watt than any other bulb. Metal Halide bulbs are nice for large, deep tanks, but they often produce too much heat for smaller aquariums. They come in all spectrums of light and are suitable for all aquarium types with the right bulb selected. Often seen as the ‘very best of available aquarium lighting’, they also have a price tag to match so unless you really do want the Rolls Royce of lighting, stick with full-spectrum instead. The term is used to let you know how much energy is needed to light the bulb, directly translates to energy consumed and hence how much you pay for your electricity bill! When choosing lighting for your aquarium, you will choose the size in wattage as the most commonly used measurement to base your decision on for the size of your tank. A lumen is a measure of the visible light emitted from the bulb, the actual amount of light that is generated. It’s a far more accurate measurement than watts, because it measures output, not input. A lot of the wattage rating is simply given out as heat, not light, especially with incandescent bulbs. As a guide, a 5W LED light can give as much light as a 25W incandescent, with most of the incandescent bulbs energy generating heat and the LED generating almost none. You can feel the difference by holding your hand near – and can barely, if at all, touch an incandescent while running. If you saw a 5W LED and a 25W incandescent, you would think the higher wattage is the more powerful. But they could have exactly the same lumen rating meaning they are equal, but the LED is more efficient, generates less heat, and has a lower electricity bill. The higher the lumens, the more intense the light, but this measurement is rarely used in ‘common discussion’ (if that’s the right term?) because it’s a little harder to understand than simply stating watts. But it’s useful to know so you can see how efficient the lighting is when comparing. For a useful chart comparing lumens output for a given wattage for various bulb types, please follow this link. This measures the color temperature of a bulb. Bulbs with a higher rating (6000K+) have a “cool” temperature, producing light on the blue end of the spectrum. Bulbs below 3000 K are considered “warm,” with a yellow-reddish hue. Freshwater live plants grow better under lamps with a higher Kelvin rating, though they do best in full spectrum that contains some yellow / red. There are so many different lighting systems and bulbs available, that it can be confusing and hard to pick the one that will be right for your aquarium. Here are a few tips for lighting up your tank. Standard fluorescent lighting is likely your best option and certainly the most common option, and will work for all but the deepest and most heavily planted tanks. No matter how weak your lighting system is, do not leave the lights on all the time! Use an automatic mains timer to give your tank between 12 and 16 hours of light each day, and 8 to 12 hours of darkness. Change your bulbs BEFORE they stop emitting light. This will keep your fish on schedule and keep the spectrum of your bulbs from changing too much as the bulb ages. Most fluorescent bulbs will last about a year but their light output falls dramatically long before they actually blow so change them sooner, at 9 months old or so. LEDs will last significantly longer. Interested in lunar lighting? Lamps that simulate moonlight will give you an accurate view of your fish at night. They’re usually weak, blue LEDs that will not disturb your goldfish’s sleep/wake cycle. With no plants to care for, your lighting options are wide open yet relatively simple. All you’re doing is providing your fish with a day / night cycle and lighting your aquarium for you to see. An unplanted, freshwater aquarium we recommend to light with fluorescent bulbs or LEDs. You can go with lamps in the blue end of the spectrum, to give a coldish looking, eerie blue tint to things, or yellowy-red lamps to bring an exaggerated, warm orange tint to your tank. If that’s what you’d like. Personally though, we recommend going with two (or more) lamps, one at each end of the blue and red spectrum, or to pay a little more for full spectrum bulbs. Either of these solutions will keep things well lit, vibrant and colorful, while looking close to natural lighting. Fluorescent bulbs come in NO (normal output), HO (high output) and VHO (very high output) options. For a non-planted tank, it doesn’t matter. As long as you can see the fish and they get a light cycle, the choice is yours. If your freshwater aquarium has live plants, your choices are a little more strict as you MUST provide high strength and good quality light for photosynthesis. We still recommend fluorescent lighting systems for planted freshwater tanks, but now the lights simply must be full spectrum and you will almost certainly want multiple bulbs. For a planted aquarium, we recommend using HO (high output) bulbs at minimum and for larger aquariums multiple VHO (very high output) bulbs as standard. NO (normal output) bulbs should be avoided as you will need too many to provide sufficient light for your plants. 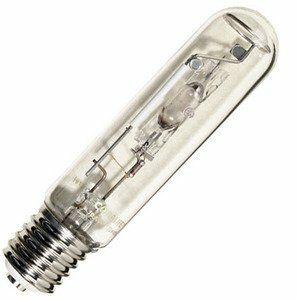 Metal halide bulbs are another and very good option but are expensive and have some safety requirements to adhere to so we don’t recommend them for beginners. Keep things easy, keep things reasonably cheap, that’s our motto – so go with fluorescents. Yes, goldfish need light and they also need nightly periods of darkness. Using lights to illuminate your tank and simulate a day / night cycle is beneficial to your goldfish, the overall health of your tank and is an important aspect of successful goldfish care. Luckily, there’s nothing more enchanting than a bright and lively aquarium teeming with fish, so tank lights should be something you’re happy to invest in. How you choose to light up your aquarium depends on many variables, including the size of your tank, whether it’s planted or not, whether you’re aiming for a natural look or perhaps a particularly red or blue tint and of course, this is down to your own personal preference. Whatever lighting system you choose, simulate a day and night cycle. Your fish will thrive on the rhythm and you’ll appreciate the stunning results. Great web-site with all the information I needed, and more! Understandable and thorough! Great…thanks much.